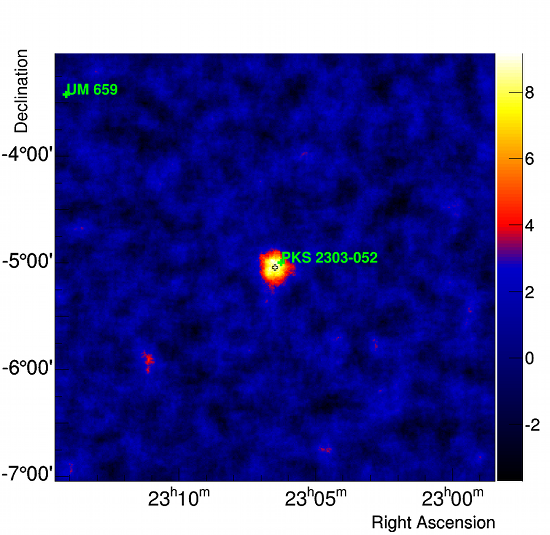 Fig 1: A map showing the significance of the emission in the sky region around the quasar PKS 2303-052 (marked by the green cross). Significant gamma-ray emission at the level of 10 standard deviations above background is observed. The gamma-ray source appears to be point-like and offset from the quasar. The emission centroid matches the position of TRAPPIST-1 (black cross). H.E.S.S. II has discovered a quasi-periodic gamma-ray signal from a source near the intermediate-redshift (redshift z = 1.139) quasar PKS 2303-052, an accreting blackhole system whose jet emission is directly towards us. The quasar was the target of 37.6 hours of observations under good atmospheric conditions, which resulted in the detection of a gamma-ray signal at a significance of 9.7 sigma. The best-fit position of this new source is at (RA; Dec) = (23 h 06 m 29.6 s +/- 10.5 s; -05 deg 02' 30" +/- 25"). Surprisingly, this position is about 4.3 arc min offset from the quasar, and the bulk of the emission therefore strongly inconsistent with originating from PKS 2303-052 (see Figure 1). Instead, the position of the new source is consistent with the ultra-cool dwarf star TRAPPIST-1, around which recently 7 terrestrial planets were discovered (Gillon et al. 2017). No other plausible counterparts of the newly discovered source are located within its error box. Fig. 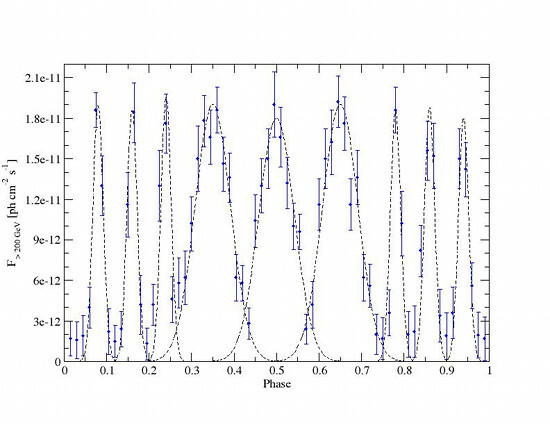 2: The gamma-ray spectrum from the direction of TRAPPIST-1 as recorded by H.E.S.S.. The emission is rather narrowly peaked around an energy of about 950 GeV. 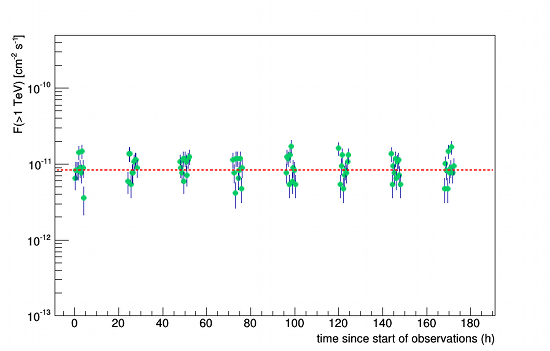 The green curve shows an ad-hoc empirical model, based on the work of April & First (2017) and folded with the energy resolution of the instrument. The gamma-ray spectrum of the newly discovered VHE source reveals a highly unusual shape, with a rather flat top, peaked around a photon energy of 950 GeV. As can be seen from Figure 2, the spectrum can be fit rather nicely by a recently proposed emission model by April & First (2017). Alternatively, the shape may be accommodated for in various models of annihilation of dark matter particles into gamma rays. However, a preliminary analysis of the lightcurve of the source makes the latter interpretation rather difficult. In fact, the almost uninterrupted monitoring campaign with H.E.S.S. allowed us to perform a detailed search for variability. Flux variability might indeed be expected if the source was associated with the quasar PKS 2303-052. Figure 3 shows the long-term run-wise light curve, clearly indicating variability on a variety of time scales. Fig. 3: A run-wise (28 minute) light curve of TRAPPIST-1. The source was observed for 8 consecutive nights; the average time spent per night was about 4.5 hours. The red dashed line indicates the average flux level. Variability in the gamma-ray flux is clearly visible. Due to the low photon statistics, no evidence for variability was found within any individual 28-min run. In order to investigate any coherent variability patterns, a search for periodic variability was performed, both using a Fourier analysis as well as a blind search for periodicity with a phase-folding technique. While the Fourier analysis remains inconclusive due to the irregular light curve coverage of the H.E.S.S. observations, the phase-folding technique revealed marginal evidence for a periodic signal at a period of (42 +/- 2) min. The periodic signal appears to be modulated by a periodic Doppler shift pattern on a time scale of (18.8 +/- 0.2) days. After correcting for this modulation, the 42 min periodicity stands out clearly. 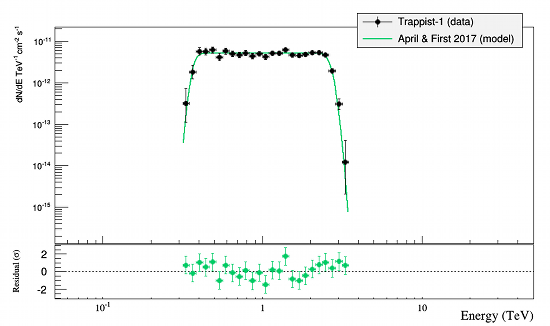 The phase-folded light curve is displayed in Figure 4. Fig. 4: The gamma-ray light curve of the source near PKS 2303-052 measured by H.E.S.S., phase-folded with a period of 42 min, after correction for a 18.8 day Doppler modulation. Strikingly, such a pattern resembles a Morse code SOS signal. As an SOS signal could hardly originate from any natural phenomenon, it must be followed that the signal was almost certainly orchastrated by an extraterrestrial civilisation. A further clue to the alien nature of the signal lies in the 18.8 day modulation of the signal, which corresponds precisely to the orbital period of the outermost planet of the TRAPPIST-1 system (TRAPPIST-1h), thus naturally explaining the Doppler modulation due to the orbital motion of the source. It is, however, puzzling (and in fact quite disturbing) that an extraterrestrial species seems to have made use of the exact same emergency signal invented by F.B. Morse almost 100 years ago. This puzzle should be addressed by external historians and linguists, as clearly there is only minor competence within the H.E.S.S. collaboration in these fields. This discovery of a periodic signal, akin to an SOS distress call, raises the question of the appropriate response. The TRAPPIST-1 system is located at a distance of 12.1 pc from the sun. Thus, if this is indeed a distress call from a civilisation on TRAPPIST-1h, it was sent out almost 40 years ago, and any response from Earth would take the same time to reach TRAPPIST-1h. Due to the indiscriminate content of the signal, all conjectures about the nature of the emergency remain speculation. However, as TRAPPIST-1h has been found to be located at the snow-line of the TRAPPIST-1 system, it is possible that the distress call was sent because of a snow emergency. Follow-up observations at various wavelengths (especially radio) are strongly encouraged in order to gain insight into the cause of the distress. H.E.S.S. Collaboration, "Serendipitous discovery of likely alien distress call", J. Easter Egg, in preparation.